Mednet has been manufacturing ambulatory cardiac monitors and supporting systems since 1994. Mednet’s markets the Heartrak ECAT Mobile Cardiac Telemetry (MCT) monitor to physicians’ offices, hospitals as well as the OEM market for accredited Independent Diagnostic Testing Facilities (IDTF’s). 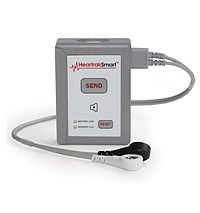 Mednet was granted 510K pre-market approval by the FDA for the External Cardiac Ambulatory Telemetry (ECAT) in 2009. Mednet is known for reliable products complies with both National and International medical device design and manufacturing standards. The ECAT Mobile Cardiac Telemetry device has proven to be a clinically viable device supporting the Mednet reputation. Various indicators on the device signaling function for battery life, monitoring mode and communication mode to assist patient and medical staff.